Ragged Point Light was constructed in March 1910 as a hexagonal screwpile lighthouse with a fourth order Fresnel lens. 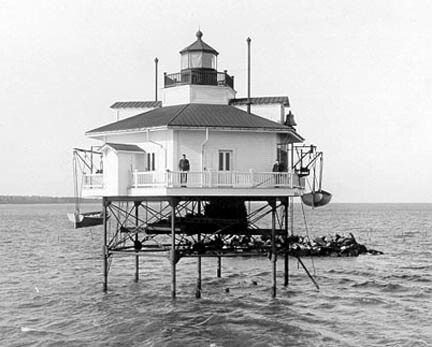 It was the last lighthouse built in the Chesapeake Bay area. It was built at Coles Point, near the Virginia shore in Westmoreland County, to mark a shoal that ran from the lighthouse to the shore. Piney Point Lighthouse in Maryland is on the opposite side of the river. Ragged Point Light was one of the first lighthouses to be dismantled. It was deactivated in 1962. The current light is a tower built on the original foundation. It can be viewed from shore at the marina at Ragged Point in Virginia. On August 21, 1862 off Ragged Point, there was a collision between the steamers Peabody and West Point, involving the loss of seventy-three lives. The West Point was from Newport News, with convalescent troops of General Burnside's army.